USA Pavilion | Expo 2017 Why? When I tell Russians (and Russian-speaking individuals) that I am studying Russian language and literature at Portland State University, their response is always “Why?”. My response is simple, I’m just very interested in the culture and language. 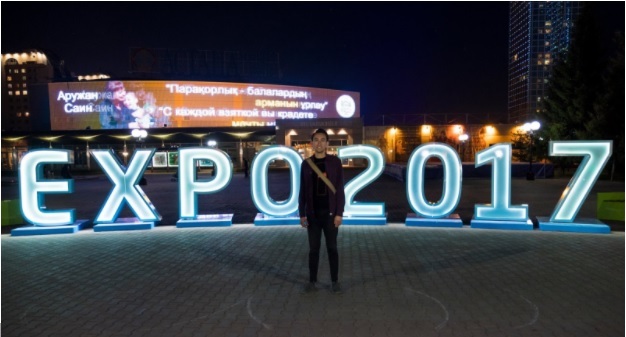 Therefore, when I learned about the opportunity to represent the United States of America at the 2017 Expo in Kazakhstan, I was ready to apply. I was very eager to practice my language skills in the late Soviet Republic and simultaneously eager to learn about Kazakh culture. This is my second time in a Russian speaking country, but my first time in a predominantly Muslim society, with strong linguistic and cultural ties to Russia. Three years ago, I studied in Kazan, Russia. Kazan’s unofficial slogan is “Where Europe Meet Asia”, the local people of Kazan are called Tartars. Their language has Turkic roots, as their history coincides with the Turks, Mongols, and Slavs – much like in Kazakhstan. I did not realize how much I would be reminded of the Republic of Tatarstan living in Astana. It’s been a joy so far finding the comparisons and differences. Kazakhstan’s culture is still developing, and any visitor with the ability to speak Russian can understand this when conversing with the locals and learning about Astana’s rapid development. This is exciting for me, because I get to be apart of the construction of Kazakhstani-American partnership that is playing a small role in Kazakhstan’s cultural development. The U.S. and Kazakhstan have had 25 prosperous years of diplomatic partnership, and being a Student Ambassador for the USA Pavilion has allowed me to make those meaningful connections with Kazakhstanis visiting our pavilion. Already, this experience differs from my time as a foreign student at Kazan National Research Technological University. Kazakhstani nationals have the opportunity to explore the spirit of the American technology and innovation, and learn that people are the energy of life when visiting our pavilion at the Expo. It will be one month since we have arrived to Astana, and I can confidently say all 40 student ambassadors are looking forward to the next two months for more fun, more laughs, making great impression on the city and its people.